I've been running again for 5 months now and am loving it! Here is some of the gear that I am loving and would recommend. They are all items that I personally use for running and enjoy using. **Keep reading for a $50 Amazon gift card giveaway! I'm back into running and am loving these shoes from Hoka One One! I am new to the brand and have been wearing them for about a month. I like the Hupana for everyday wear. They are light and comfortable to walk around in all day. I basically have not taken these off since I got them. They have a seamless upper which looks great and is comfortable. I need cushioning for running and am liking the Clifton for running distances. They are a neutral shoe with moderate cushioning. I've been running 7.4 miles in them twice a week and really love them! They provide enough cushioning without being too bulky. It's crazy because I had not heard of the brand until recently and am now seeing them everywhere! I wore them for 3 days straight in Washington DC where we literally walked everywhere and they were extremely comfortable for tons of walking. In the photo below, I'm wearing the Clifton shoes. The Cavu shoes are great for everyday wear as well. They have tons of colors and varieties so there should be something for everyone. I look forward to experimenting with these more. 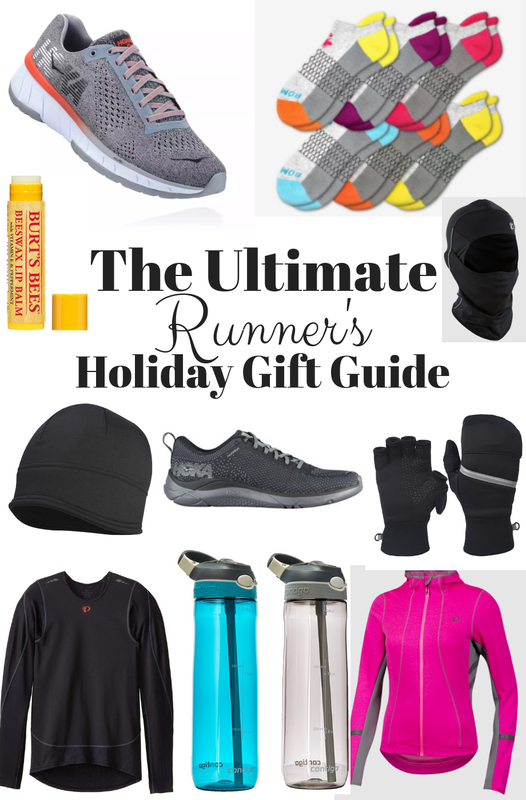 If you have a runner in your life, they may love these for a holiday gift! I was in major need of winter hats and gloves for running and am loving these from TrailHeads! They keep my head and hands warm without being too hot. I like the Power Stretch Gloves, Power Stretch Mittens and the Power Contour Hat. The hat actually covers my ears which is great because some other hats do not. High quality, thick plush socks are super important to me. I hate thin socks that provide no support. Bombas socks hold up for years in my experience and are super cute! I like the ankle socks in any color. These are some of the comfiest, thick socks that I've tried without being bulky. They comes in fun colors which I'm all about the colorful socks and we like the kids and men's socks as well. I have been wearing these for 2 months almost daily. They are the best, thickest socks. They are super comfortable for running and provide a little extra cushioning which I need. I've been a fan of Pearl iZUMi shoes for years- more for walking that running but was excited to try some of their cold weather gear. I am loving this thermal hoodie in hot pink. When I run with my dad at 5:53 AM, he gets mad when my running jacket is black or grey because I can't be seen by cars. I can be seen now Dad!! I'm also super excited about these lobster gloves because in Michigan, it can get down to -10 degrees and I am going to need some super warm gear. Sadly, it also gets cold enough to call for wearing a balaclava and this one from Pearl iZUMi fits really well and has great wicking material. Pearl Izumi's line focuses on cycling but also work great for running. I also love the base layer shirt which kept my very surprisingly warm on a recent 7.5 mile run. My one recommendation with that is to size up because it is shorter in the front. My favorite water bottle for about 7 years now that never leaves my side. I use this to hydrate before and after running. I like the 24 ounce ones with a straw. My #1 favorite lip balm for many years. I carry this in my pocket when running during the cold months if my lips get dry and chapped. It's the best! The giveaway will be for a $50 Amazon gift card to one winner! Some of the products in this post were provided as samples for this post. All opinions are my own. I am most excited to get together with family this holiday season. I am most excited to see my son who has been away from home for months. Most excited to see friends and family this holiday. I'm most excited about seeing family that is from out of state. I am most excited to see my family and friends during this wonderful holiday season. I am excited to celebrate the holidays with a brand new great-nephew. I can’t wait to spend time with family and friends. I am most excited for my brother to receive stem cell replacement. I am just excited seeing the happiness on my kids face. They love making cookies, listening to Christmas music and doing many great things to help others out with their church groups. Excited about spending time with the family and good food! I'd like the stem cell! I am most excited for church and Christmas dinner with my family. Looking forward to spending time with my family. I am most excited to spend time with my family who live out of state. I'm excited to visit with friends I haven't seen in a long while. I am most excited to see my daughter who has been away at college.